This poster is for a re-release, from the 1970s. The artwork is a collage of different artwork from different films. In the center, it's Steve Reeves from THIEF OF BAGHDAD (1961). The flying horses are also from the Reeves movie. 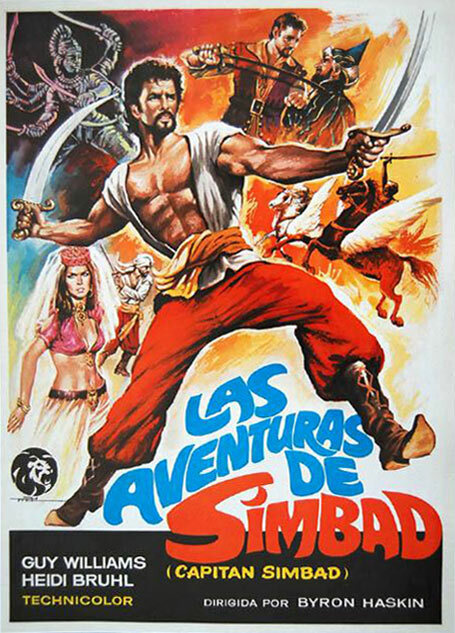 Then on the left there are scenes from THE GOLDEN VOYAGE OF SINBAD (1973). And on the top right is an actual scene from this film starring Guy Williams. Talk about Cinematic Confusion.